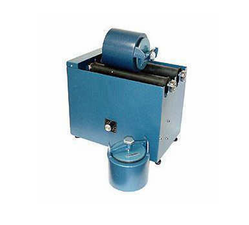 Pioneers in the industry, we offer jar mill from India. The unique operating characteristics of our Jar Mill/Pot Mill satisfy the most stringent requirements of the chemical, ink, paint, plastics, food, ceramic and pharmaceutical industries. Our jar mills are ideal for grinding laboratory or high-purity samples. These mills provide quiet and smooth operation. Sturdy welded steel frames, powerful roller drives and heavy duty pillow blocks with cartridge-type sealed ball bearings for efficient operation. Three-position adjustment securely mounts idler roll, yet it can be quickly changed. Looking for Jar & Pot Mill ?